Clamoring for yet another sequel this summer? Well then, you're in luck because this weekend offers up a double slate of them. Angelina Jolie returns for a second round of tomb raiding and a couple of kids do some more spying to cover the "been there, done that, want to do it again" crowd. What also makes this weekend notable is the unofficial start of Oscar season with the release of Seabiscuit. The first film of 2003 that has had the right pieces in place to gain attention from Oscar wags, it's also the least likely of the new films to make serious noise at the box office. Let's get right to it; the first Tomb Raider movie sucked bowling balls through garden hoses. Didn't make any sense, the action was poorly directed and what you could see of it was edited beyond comprehensibility. A decent start of $47 million was negated by a $131 million finish and a Razzie nomination. Thus, it shouldn't be too surprising that the second films release gets the "they made a sequel to that?" treatment. Paramount's in dire need of a franchise, with Mission: Impossible sequels taking so long to produce that the greenlight for these less hefty sequels is given. Happily, for anyone who dares to buck the original's reputation and see the film, the entire creative team for the first instalment has been chucked. Bruckheimer protege Simon West and the writing crew were dumped for Speed (and Speed 2) helmer Jan de Bont and it-boy scripter Dean Georgaris (who has already been tapped for the third M:I film). Even Jolie has commented on the disappointing nature of the first film. Really, it has nowhere to go but up in comparison. It's not that the franchise is unfilmable; it's simply a question of whether its reputation was irrevocably harmed. In some ways, it seems impossible that Tomb Raider: Cradle of Life won't be hurt by association but then again, there's a second Jeepers Creepers film coming out this year so anything's possible. In a tangible sense, this episode simply looks much better from the start. A shift to a better and more recognizable concept (Pandora's Box) gives it a firmer grasp in the public's consciousness and sits it better in the "female Indiana Jones" territory that it so covets. Jolie hasn't done much in the two films between these, with the much delayed Original Sin a complete mess and Life or Something Like It being completely unsuited for her. Neither cracked $20 million. Jolie's definitely busy with five films already coming out in the next two years, so while it's not crucial that this franchise continue for her, it's not good for her to have yet another bomb on her resume. The best-case scenario is a film that doesn't start off quite as well as the first (especially considering ticket inflation) but also doesn't suffer the damning critical reception and makes more in the end. And that silver suit is worth at least a few million on the weekend. Look for $44 million to start. It wouldn't take that much to have it end up earning more than the first Tomb Raider. Easily a candidate for "Most Gimmicky movie of the Year," Spy Kids 3-D is a big wildcard in the weekend. While there was a disturbing drop off between outings number one and two in the franchise, Robert Rodriguez makes them cheaply enough (literally editing them in his garage) that they continue to be a decent cash cow for Miramax and giving him the freedom to try stunts like making part of the film in 3-D. It's a cinematic trick that's been reserved for amusement park rides and IMAX movies for quite some time, having been cheapened by association with poorly made B-movies. The last 3-D film I can recall in wide release is Nightmare on Elm Street 6, which did get a bit of an uptick from Nightmare 5. On the other hand, this makes the concept fresh to the majority of its target audience, who would barely have been born when that film came out. Rodriguez seems to have pulled in some favors casting wise (or is it the other way around? ), with Sylvester Stallone (perhaps desperate to be associated in any form with a hit) and George Clooney (who also cameoed in the first Spy Kids movie), among others. 3-D serves a bit of a point here (and I love that they resurrected the "gasping audience" shot) since the plot of the film has the Spy Kids entering a three-dimensional video game, resembling a cross between Robot Jox and Tron. I think there's enough interest here to squeeze out one more film in this franchise, especially with the gimmickry of the marketing. If the 3-D proves to be truly innovative, a $19 million start could be the lead-in to a late-summer hit. Just when you thought the entire summer of 2003 was going to be entirely sequels and braindead comedies, an actual film shows up. 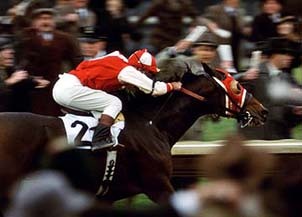 Seabiscuit is an underdog sports story in the vein of Rocky, but with horses. A depression-era phenomenon, Seabiscuit was a horse that was judged too small to be a winner, had a too-big, half-blind(!) jockey and still won race after race. This is the kind of thing that audience-pleasing Oscar winners are made of. It'll have to really work for it, though, since despite their reputation, sports movies rarely blow the doors off the theater. The cast is solid, with the main recognition coming from Spider-Man himself, Tobey Maguire (quick, name Christopher Reeve's non-Superman hits) along with Jeff Bridges and recent Oscar winner Chris Cooper. It's also written and directed by Gary Ross of Pleasantville and Dave fame, so a pedigree of quality is certainly there. The marketing machine started up pretty early on this one, as Universal started placing ads around the time of the Triple Crown races. It also got a bit of free advertising as the film that nearly cost Maguire the job as Spider-Man due to an injury he sustained on set. However, aside from the horsey set and those with a historical interest in the material, it's going to sit below the radar until word-of-mouth is able to take its course. As the first film to receive serious attention from the Oscar set, it seems apropos to discuss its chances at major awards. The answer here appears to be: not that good. Not that it's a terrible film but with exactly zero contenders up to this point, it's hard to fault people for grasping at the first film that does look good. Like last summer's Oscar kick-off film, Road to Perdition, it's probably going to stick around as the top film until October or so and fall by the wayside almost completely when critics awards come out. It'll have to really catch on with audiences (to $125-150 million or so) to have much in the way of a serious shot. Starting on under 2,000 screens, it's going to have a tough time at that and will probably open with around $11 million. Second place this weekend will be contested by the two Bruckheimer films that finished one-two last weekend... well, perhaps "contested" is too strong a word, as the thrilling Pirates of the Caribbean will easily vanquish the dreary and numbing Bad Boys II. With a sub-30% drop in weekend number two, Pirates established itself as on the road to being one of the summer's biggest hits, perhaps as high as number two or three. As an overblown (literally) sequel, Bad Boys II will be lucky to keep its drop below 50%. There's no contest here, with Pirates of the Caribbean earning another $25 million (at least) where it will hover just under $175 million. Bad Boys II might hold the $20 million mark on its way to $125 million total. Mopping up the business for the rest of the returning films will be Finding Nemo yet again as it should outlast three different films ahead of it, The League of Extraordinary Gentlemen, Terminator 3 and Johnny English. Gentlemen has exceeded my meagre expectations, as it will actually pass $50 million after "just" a 56% drop. Watch for it to shed screens very soon. Terminator 3 may make its way to $175 if lucky, but big international business could make this a significant hit and provide real justification for a Terminator 4. Johnny English becomes a bit of a miss with probably only $40 million in the offing but it's already made its millions overseas. So, Finding Nemo continues along swimmingly, and will hit the number 11 spot all time, surpassing the first entry in the Lord of the Rings saga. It's astonishing, really, given the low amount of hype this received prior to summer. I haven't talked nearly enough about a small New Zealand film that's been quietly bringing in and moving audiences for almost two months of release now. Whale Rider, which was picked as the audience favorite for last year's Toronto Film Festival, has made an encouraging $8 million in quite limited release. A story of empowerment for a young Maori girl, this movie is a true pleasure. Still hovering below the top ten, it has had a couple of weeks of uptick in its screencount and is reaching a possible critical mass. This weekend, on 491 screens, it has a slight potential to hit the top ten in the next few weeks as older films fade, adding all the press that brings to a film's campaign. I strongly urge everyone with the opportunity to witness one of the year's treasures.